Manchester United and Arsenal face off on Friday night at the Emirates Stadium in the fourth round of the FA Cup. They’re the most successful sides in the history of the competition, as Arsenal lead the way with 13 wins, while United are only one behind their bitter rivals. It might still be early in the competition, but expect both clubs to put out a strong starting lineup in an attempt to advance to the next round of the FA Cup. Manchester United could not be in better form coming into this game. Since bringing in Ole Gunnar Solskjaer, they won seven straight and managed to beat Spurs at Wembley Stadium. They’ve closed the gap between themselves and fourth place Chelsea down to just three points, and have brought their goal differential all the way up to +13 on the season. Marcus Rashford has scored in five out of his last six league appearances, while Paul Pogba has grabbed five goals and four assists in that same timeframe. Almost everyone on the roster is in sparkling form, and United now look to keep the good times rolling against the Gunners on Friday. For Arsenal, their biggest problem has been a lack of consistency in recent weeks. In their last game, they picked up a crucial victory against Chelsea after goals from Alexandre Lacazette and Laurent Koscielny. However, the week before that saw a rugged side lose to West Ham in a game at the London Stadium. They were demolished by Liverpool about a month ago, but followed up that performance by blowing Fulham out the water. 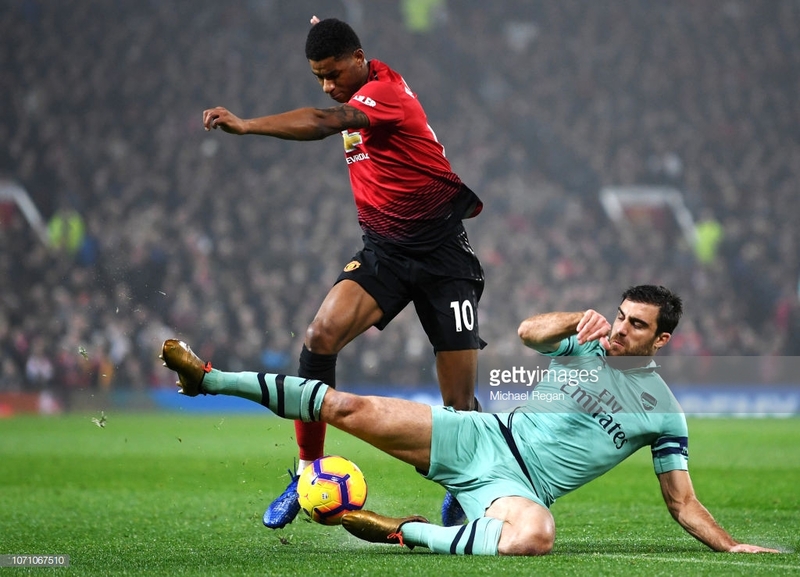 At this point, it’s impossible to predict just what kind of Arsenal team is going to show up at the Emirates, which is both good news and bad news for United. The two sides faced off earlier in the season at Old Trafford in one of the craziest contests of the Premier League campaign so far. Arsenal were the ones in flying form coming into the matchup back then, while United were still struggling under former boss Jose Mourinho. The away side would grab a shock lead after a howler from David De Gea, who somehow managed to let a weak header slip through his hands. It wouldn’t be long until United equalized when Anthony Martial prodded home from a few yards out after Arsenal failed to properly clear a free kick. Another error from the Red Devils would give the Gunners the lead once again, as Marcos Rojo gave the ball away in his own half before accidentally tackling it into the back of his own net. However, just like earlier in the game, Arsenal immediately conceded after a defensive calamity of their own. A hopeful long ball somehow sat still in the penalty area, and Jesse Lingard reacted first to poke the ball past Bernd Leno to tie the game up at 2-2. The contest would end that way, which was a fair result considering how poor both teams had been at the back. Marouane Fellaini is the only player who is currently guaranteed to be out through injury. However, the Red Devils do have three defenders who might not be able to recover in time. Chris Smalling and Marcos Rojo both only recently returned to training, while the status of Luke Shaw is still up in the air after he picked up some sort of injury in the warmups ahead of the win against Brighton & Hove Albion. There is good news, luckily, as Solskjaer was able to confirm that Alexis Sanchez is set to feature against Arsenal after missing the last two games for United. Arsenal are in a similar spot to United when it comes to injuries, but they were dealt a major blow when it was confirmed that Hector Bellerin tore his ACL in the win over Chelsea, effectively ending his season. The London side are also missing Englishmen Danny Welbeck and Rob Holding, who are still recovering from long term injuries of their own. Former Red Devil Henrikh Mkhitaryan is also likely to miss out, as the Armenian has just returned to training after suffering from a fractured metatarsal. Manchester United: Romero, Dalot, Jones, Lindelof, Young, Matic, Herrera, Pogba, Sanchez, Lukaku, Rashford. Arsenal: Cech, Lichtsteiner, Sokratis, Koscielny, Kolasinac, Torreira, Xhaka, Guendouzi, Ozil, Lacazette, Aubameyang.